After walking away from an absolutely HUGE River Grudie, by Lochluichart, Torq, Arran and myself headed west to take a trip down the Wester Ross Carron for our first paddle of 2013. Where’s the Water  said the river was on high, but the SEPA guage is in the lower reaches and after a couple of confluences, so high on the guage actually meant a medium. But, that din’t put a dampner on it and given I’d not been out for a proper paddle in almost 2 months, it proved a good way to get back in the saddle and burn off a few Christmas pounds! After getting onto the river in a bleak, open and wind/rain-swept head of Glen Carron (about 1km south-west of Loch Sgamhain), we headed off. The river starts relatively narrow and shallow, but picks up speed and volume as the side of the glen close in. The first feature comes immediately after a small footbridge that spans the flows about 1km north-east of Glencarron Lodge (the bridge is marked on the OS map). The sides of the river rise a little and the river becomes narrower. The fall was easy enough at medium levels – with a wee boof and good forward lean – but I recon it could get quite sticky in higher levels. The river then opens up again and after about 1km or so you come across a large boulder in the middle of the flow. Easiest route at medium levels is to peel right, but check for logs and branches. We got out to inspect. The first gorge follows not long after, with closed in sides and lots of small/medium stoppers and wee ledges. Easy enough (probably Grade 3) in medium flows, but I reckon i could get a bit fruity with more water! A nice section of river. After a couple of 1km, the gorge opens up for a few hundred meters. The second gorge then follows, beginning with a right-angle right-hand bend. The most serious feature of the river is about 50m after this, so it’s wise to get out just before hte second gorge starts to check for trapped trees. As this feature is a slot, with a right-angle lead in, strainers could be a real hazard. 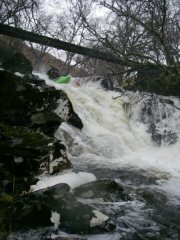 We intended to eddy out just above the drop, but a large tree has fallen into the eddie which makes this all-but impossible…Torq and Arran ended up running it backwards and I somehow managed to spin round just in time – lesson learned! The rest of the second gorge is much the same as the first, although about half way down a wee trib enters from river right via what seems to be a paddleable 2-3m high fall, if someone gets up there to chainsaw out a trunk. Would be good for some funky headcam action! Then the gorge then ends, after another kilometer the Allt a’ Chonais enters from the south (river left), then after another couple of km’s the get out is river right directly south of the level crossing near Jerry’s Hostel ()best place to park is Forestry Commission Scotland’s Achnashellach car park). Anyhow, all-in-all it was a good trip. The main thing, however, to remember on the Wester Ross Carron is that it can get chocked with trees, so always check out the tree main features before running them…and watch out for overhanging rhododendron!